The Sanitaire SC9050A DuraLite commercial vacuum cleaner uses high-strength magnesium, for components that are 75% lighter than steel and 33% lighter than aluminum, all with better anti-corrosion and mechanical properties. CRI Green Label certified, the lightweight Sanitaire SC9050 vacuum cleaner features an 13 in. cleaning path 5-amp motor, dual-zipper easy-access disposable dust bag and no-tool belt change. It is an excellent choice for healthcare, education, hotel, food service, government and building services applications. Your Sanitaire commercial cleaner is warranted to be free from all defects in material and workmanship in normal use FOR A PERIOD OF TWO YEARS (Models SC678, SC679, SC689 are warranted for ONE YEAR). The warranty is granted on purchases on June 1, 2009 and later, and only to the original purchaser of the cleaner. The warranty is subject to the following provisions. Parts of the cleaner that require replacement under normal use, such as bumpers, filters, bristle strips, bags, belts, light bulbs and hoses. Damages or malfunctions caused by negligence, abuse, or use not in accordance with Owner’s Guide. Defects or damages caused by unauthorized service. The E.H.C.P. Company will, at its option, repair or replace a defective cleaner or cleaner part that is covered by this warranty. As a matter of warranty policy, the E.H.C.P. Company will not refund the consumer’s purchase price. 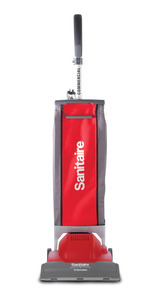 If it is necessary to ship the cleaner outside your community to obtain warranty repair, you must pay the shipping charges to the Sanitaire Authorized Warranty Station. Return shipping charges will be paid by the Warranty Station. When returning parts for repair, please include the model, type, and serial numbers from the data plate on the cleaner.